Today I'm along with the Sweet Innocence Tour. We were asked to change up the pattern and I had a lot of idea's! 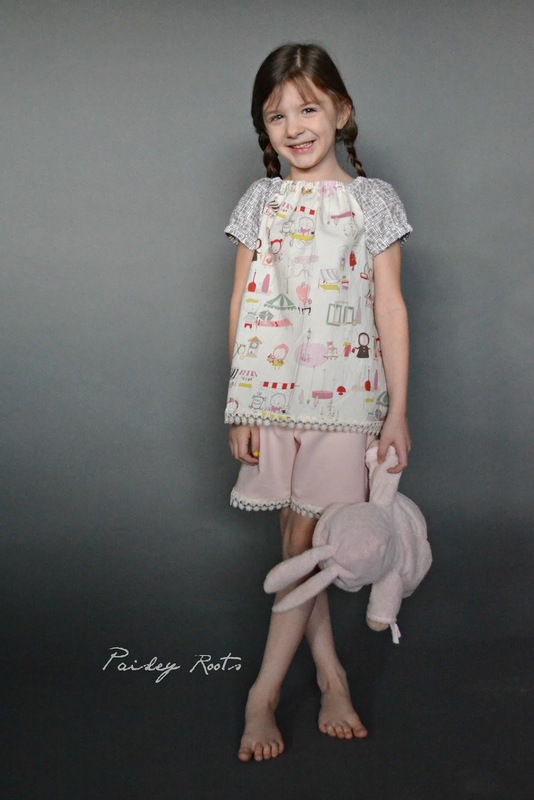 Finally the need for some cute and adorable pajama's won out! The Sweet Innocence pattern is actually 3 patterns in one. You have the peasant dress, the ruffled pants and an overdress. 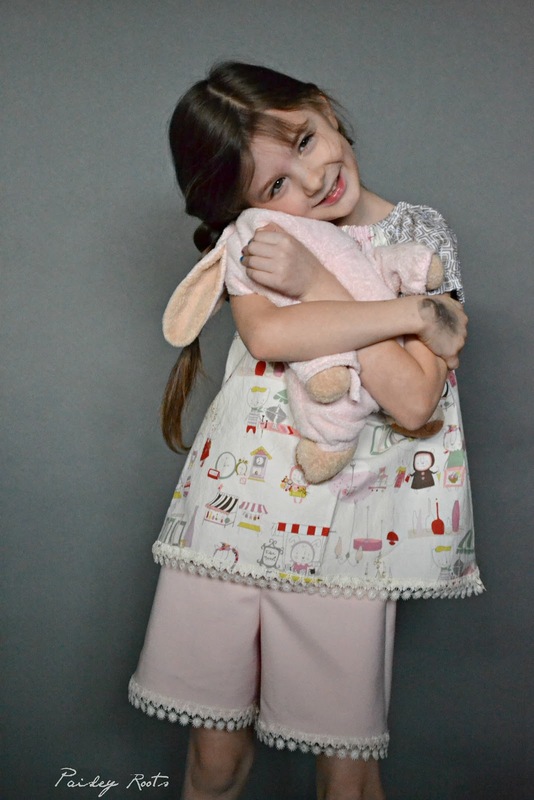 It's a gorgeous look and perfect for a little girl! 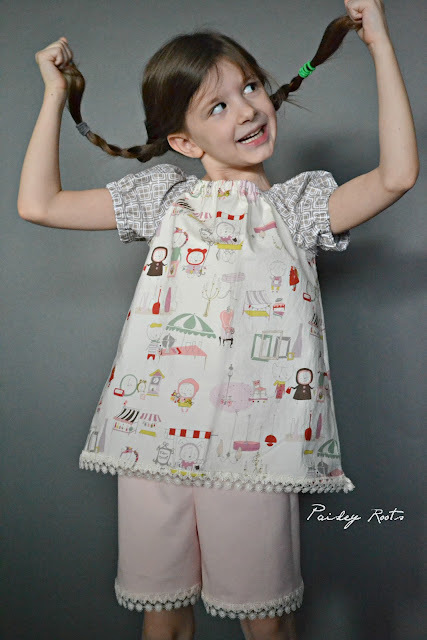 On the original pattern the peasant top has elastic around the high waist and then ruffles. Since this was for Pajama's I chose to adjust it to an aline top for more comfort while sleeping. I just added more paper to the desired length then made a line from the under arm to the hem. 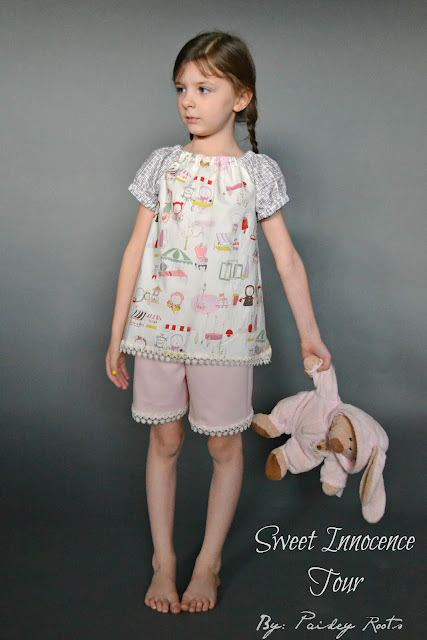 My kids do not like warm pajama's, even during the cold winter, so I knew shorts would compliment this perfectly. To make the shorts I just cut the pattern at a length I knew Paisley would like. I added lace to both the top and legs of the shorts. You can use the code: SIBLOGTOUR for $4 off a $10 purchase in her etsy shop. It's good through December 14th, 2015. I was also given the chance to give one pattern away! So make sure to enter the rafflecopter and check out My Treasured Heirlooms! Oh, and the ink on her hand is our "baymax space man" stamp. All the kids wanted a stamp on their hands! Not really sure what I was supposed to do with the raflecopter thingy but tried. I've already visited your page loads. Not a fan of instagram I'm afraid. Love your patterns.